El Clasico is always a special day, not just in Spain but all over the world. No matter which team you support, if you like football, chances are you are watching Barcelona and Real Madrid provide us with yet another spectacle. 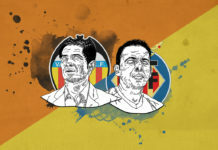 This particular clash of the titans was somewhat different with the notable absences of Lionel Messi and Cristiano Ronaldo for the first time since 2007. At the end of the day though, it was more or less, as predicted: the second team in La Liga facing the seventh. As cruel as it might sound, the demolition derby at the Camp Nou was just that: a demolition. 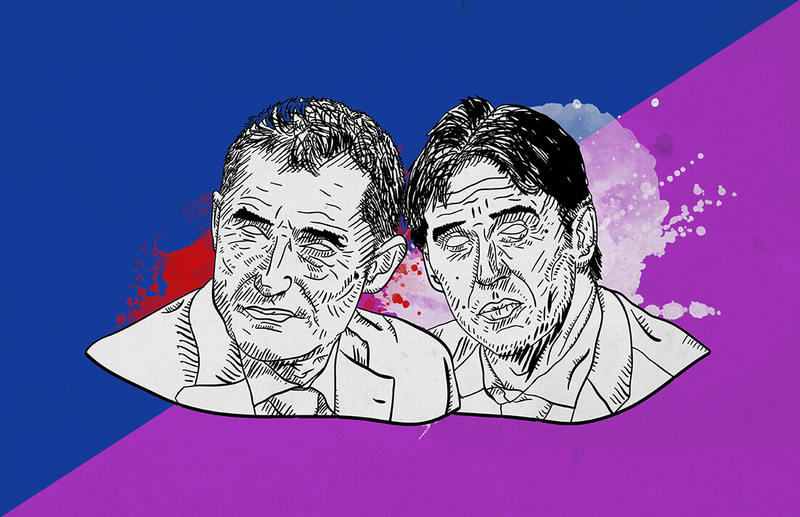 In this tactical analysis with statistics, we take a look at how Barcelona crushed their eternal rival, kicked them down to ninth place and probably gave Julen Lopetegui his second sacking in less than half of a year. Once again this Barcelona team was questioned in Messi’s absence and yet again the Catalan giant proved the world wrong. Ernesto Valverde was impressed by his team’s performance against Inter Milan on Wednesday so he decided not to tamper with a system that clearly works. It really does, and what better game to prove it in than El Clasico? Rafinha started the game on the right wing, and Sergi Roberto was once again given the nod in front of Nelson Semedo. This more conservative approach seems to complement Valverde’s style but also the personnel without the little Argentine wizard. Again, this was a 4-3-3 formation, similar to what Julen Lopetegui opted for on the other side of the pitch. He too decided to take little to no risks so he deployed his best XI. Instead of the Madrid renaissance, however, he lived to endure déjà vu. Los Blancos saw another “manita” (little hand, an expression used to demonstrate five goals scored by a team), just like they did in 2010. Although this version of Barcelona started to look nothing like the Barcelona we once knew, Ernesto Valverde is slowly but surely making a great comeback of the tiki-taka possession style of football. The first step towards that goal was the re-integration of the 4-3-3 system that the Catalans enjoyed for so many years since its inception. 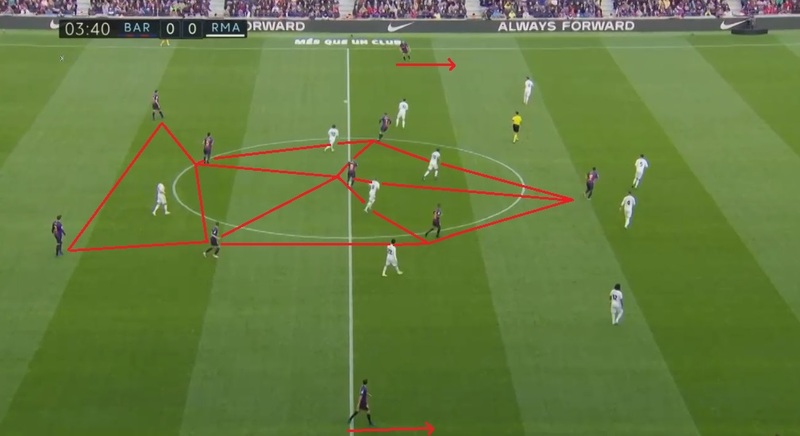 What Barca have been doing as of late, which is new to most of the games they’ve played under Valverde, is the high emphasis on the midfield once again. For Blaugrana, this used to be where the games were won and lost and back in the day. With probably the best midfield trio of all time in Xavi, Iniesta, and Busquets, they regained their status as one of the most dominant forces in world football. Over the years, the influence of that midfield superiority somewhat diminished, especially after Xavi left and time eventually caught up with the Don. It might be an absurd thing to say but all it took was a Messi injury for Valverde to start thinking outside the box. Instead, he had to start using actual tactics instead of just relying on Messi to problem-solve on the spot. Once again, Rafinha was the one who stepped in and occupied that right flank. Similarly to the game against Inter, he cut inside and left the wing for Roberto to exploit. The same thing happened on the other side with Coutinho and Alba. This, again, resulted in an overcrowded midfield which in turn pocketed Madrid’s. The difference from before was that this time, Real’s only player in proper form, Marcelo, occupied the same side. Barcelona focused numbers into the midfield, overcrowding and maintaining control while the full-back provided width. The Brazilian left-back is Madrid’s biggest attacking outlet (43% of all of their attacks come from the left) so by putting Rafinha in, Valverde basically shut down their greatest threat. Barcelona’s right side was, for the most part, quiet or simply quieter than the left one. This was mostly due to Marcelo’s sheer presence. Roberto didn’t push all the way up, which lead to his combination with Rakitić and the younger Alcantara brother easing the pressure. Still, the away team struggled to even get the ball to begin with. The first 45 minutes were as dominant as Barcelona could’ve hoped for and everything went smoothly. The goal to put the hosts in front came in the 11th minute and it was a proper marvel to watch. Barcelona made 30 touches before Rakitić found Alba sprinting on the left with an absolute beauty of a ball. The Spaniard left Nacho in his dust as he burst into the opposition’s box to find Philippe Coutinho doing his best Messi cosplay for an exact replica of the usual Messi-Alba combination that mostly results in a goal. And what a goal it was. 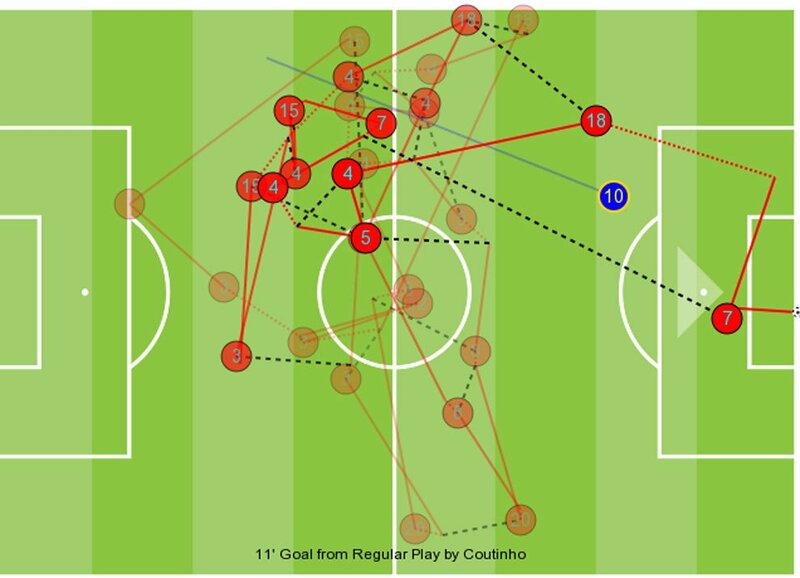 Barcelona made 30 touches before Coutinho scored the opener in the 11th minute. Ernesto Valverde is not really known for his experimentation. A midfield trio of Sergio Busquets, Ivan Rakitić and Arthur Melo was already set in stone before the match. This same trio that brought down Inter was the downfall of Real Madrid. Barcelona were exceptionally stern in possession, especially in that first half. Sixty per cent possession and 326 passes completed (126 more than Real) with 82% accuracy speak for itself. Modrić, Casemiro, and Kroos couldn’t get close to the Blaugrana shirts. Rakitić boasted the second highest tally of passes behind Alba (45 completed), completing all 43 attempted in the first half. The biggest contribution to this was how free he was in possession. Barcelona’s midfield is usually mostly press-resistant but this was simply on a different level. The key was, once again, overcrowding the midfield. Coutinho dropped deeper, pulling Nacho with him, Suarez occupied Varane and Arthur pulled Modrić. This left Rakitić completely unmarked and free to send a pinpoint accurate ball to Alba who was on a highway to Courtois’ doorstep. Sometimes, as seen below, Madrid would try to double-team the opposition. While that was somewhat effective in high pressing, it was also a double-edged sword because it would usually leave at least one Barcelona playmaker without a marker. Real double-teaming on Barcelona’s players. By pulling away the markers, the Catalans would always have one free playmaker on the field: in this case, Rakitić. This match also saw the debut of VAR in El Clasico and it favoured the hosts. In the 30th minute, Suarez converted a penalty after the referee consulted the video technology. Courtois guessed or read the side well but was too late to stop the shot from making it 2-0 to Barcelona. Again, the set up was similar to that same pattern we saw throughout the game: Alba gets the ball wide and sends it into the box. This time, Varane mistimed his tackle and got Suarez’s leg instead. The Frenchman’s dip in form after the World Cup translated into this game and after the first 45 minutes, he had just one successful tackle, one interception, and three clearances. Undeniably, he was not having a great day. But then again, almost no player in a white shirt was. One should not forget Arthur Melo, who really impressed (once again) and marked his first El Clasico with a great performance. The Brazilian completely rejuvenated Barcelona’s midfield at just 22 years old. His ability to create passing options when it seems that there are none is extraordinary. A simple twist and turn, or just his movement with which he loses markers should also not be overlooked. He finished the game with 94% passing accuracy, even edging out Busquets who was at 92%. Two goals down at halftime, Lopetegui had to act quickly or all would be lost in a second. Even though everyone expected the same dominance to continue from Barcelona, it was Real who took the first step forward when the players returned from their break. Los Blancos made one crucial change to their setup. Out came Varane (presumably because of an injury) and in came Lucas Vazquez. This subtle and yet huge change resulted in a complete system transformation. Instead of 4-3-3, Real were now playing in a 3-5-2 system that would see Casemiro drop and serve as a libero while Vazquez would be tasked with tracking Alba. This, in turn, more or less freed Gareth Bale from his defensive duties. Admittedly, he had not really done them to the fullest in the first place. Ramos could then move a bit to the left, providing cover behind Marcelo so the Brazilian could burst forward again. Lopetegui’s answer to a hectic first half was the introduction of Lucas Vazquez. Real adopted the 3-5-2 system after that, giving more freedom to Bale and Marcelo. This worked and Real managed to sustain longer periods of possession in the first 15 minutes of the second half, decreasing Barcelona’s advantage to ‘only’ 54 %. More importantly, this resulted in a goal. It all started with a great tackle by Sergio Ramos to dispossess Luis Suarez. The Spaniard started the break and the build-up from the back was finally successful for Lopetegui’s men. Clemont Lenglet was, again, a victim of fate’s cruel game and his deflection landed right at Marcelo’s feet. A quick side step followed by a great shot cut Barcelona’s lead into half. Things started to look better for the visitors. But it was only a false alarm. Ernesto Valverde reacted by subbing off Rafinha and putting in Nelson Semedo. The Portuguese slotted into the right back position. This meant that Sergi Roberto would move higher up the pitch and occupy that right midfield/wing spot. Semedo’s pace negated the impact of Marcelo, who was forced out soon after because of an injury. Roberto moving to midfield also meant stability and structure. The center of the pitch was once again bulletproof for Barcelona. The latest La Masia graduate to fully make it into the first team showed why he is rated so highly. Roberto netted two assists, both to Suarez, and finished the game with 90% passing accuracy and 50 passes in total, two of which were key. The introduction of Ousmane Dembele and finally Arturo Vidal were the last nails in the coffin that will most probably leave Lopetegui without a job. Real still has an incredibly talented roster full of superstars. 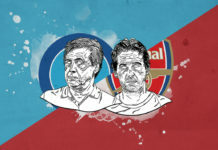 Apart from the managerial and tactical shortcomings, however, they are underperforming both individually and as a squad. This was their third loss in a row in La Liga for the first time since May 2009. The team seems unmotivated and without proper desire. Still, the blame goes three ways: The coach, the players, and the board. Lopetegui himself is to blame because he was not courageous or imposing enough to stick to his gameplan. He originally intended to play possession-style football, build from the back and pressure high up the pitch without the ball. The dressing room supposedly reacted badly, which forced the ex-Spain coach to revert back to this Zidane-esque system. However, one major difference is that Zidane had Ronaldo and Lopetegui has no one. As harsh as it may sound, there currently is no real poacher or a prolific goal scorer in Madrid’s troops. Benzema has good link-up play but lacks the finishing touches. Bale could potentially be the answer but the Welshman is too injury prone. Isco is also more of a playmaker and betting on Mariano is far too early, considering his age, experience, and skill (for now). This oversight is on the board. Thinking that Ronaldo’s absence would not be felt was ridiculous, and now it has come back to haunt them. As if the lack of a proper goalscorer wasn’t enough, Real currently suffer from a lack of chance creation. This season they have seen a huge drop of 35-40 % in the number of open-play chances created. When they do create something, there’s rarely anyone in the final third to finish it. Hence the 1.44 goals per game with xG of 1.94. El Clasico was once again a spectacular event, even without its star players. Messi was in the stands and Ronaldo in Turin but both watched as Barcelona battered Real to the ground. In doing so, they jumped to the top of La Liga standings, leaving Real all the way down in ninth. Maybe this was to be expected. A team that has Suarez, Coutinho, Dembele, Busquets, Rakitić and other big names should, at least in theory, not feel Messi’s absence that much. When he is on the pitch everything revolves around him. Putting all your eggs in his basket is somewhat understandable. Now the world knows that Barcelona has taken the first steps towards moving on. Of course, football without Messi is something none of us are ready for just yet. When he is not around though, it’s good to see some other players can take the responsibility of leadership. Suarez was the man of the match with a hattrick and a stellar overall performance. He’s also the first man other than Messi to score a La Liga hattrick for Barcelona since Romario in 1994. Still, the league is a marathon not a sprint. When Messi returns in 10 days, it will be interesting to see whether the team can continue this perfect run of form after his return. On paper, it can only get better with the greatest player of all time dancing around the pitch again. Only time will tell but after a long while, it is really exciting to be a Barcelona fan again. Tactical analyst and FC Barcelona fan, lover of the tactical side of the game. Follow me on Twitter.